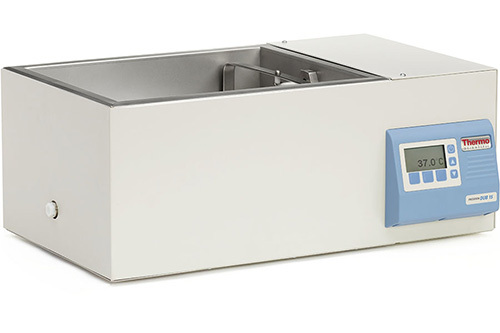 Dubnoff shaking water baths are designed specifically for applications that require your samples to be incubated in a controlled atmosphere. For this reason (1) large and (2) small gassing hoods are included with your purchase. Auto-On and Auto-Off: Set a timer in hours and minutes for both a start and finish time. For example, if you want the bath to start in 60 minutes and then turn it off 30 minutes later, set the start time to 1:00 and set the off time to 1:30. Low Fluid Protection: When enabled and the reservoir level nears empty the bath will shut down and, if enabled, the alarm will sound. The controller will also have an error displayed. Audible Alarms: Alarms can be set to sound when reservoir level nears empty, your selected (set point) temperature is exceeded, the fixed high temperature maximum is reached (safety feature), as well as general malfunctions. Many Accessories: A full selection of options including gassing hoods, flask clips, trays, and other items are available in the accessory section below. Universal Voltage: This bath can be used in the US with a 60Hz standard 120V or dedicated 240V outlet. It can also be used internationally at 50Hz and 230V. Part Number 3166184. This microfuge test tube rack holds 63 x 0.5 mL tubes. It measures 127 x 101 x 39mm (5 x 4 x 1.5in). Clip Fasteners (item 3166189) are required. Part Number 3166185. This microfuge test tube rack holds 30 x 1.5 mL tubes. It measures 127 x 101 x 39mm (5 x 4 x 1.5in). Clip Fasteners (item 3166189) are required. Part Number 3161597. The test tube tray holds 10 test tubes, 13 to 25 mm. Measures 5 x 10.2 inches. Part Number 3161599. This tray holds 18 x 25 mL flasks. Measures 5 x 10.2 inches. Part Number 3166228. This tray holds 10 x 50 mL flasks. Measures 5 x 10.2 inches. Part Number 3164716. Measures 286 x 318 x 191mm (11.25 x 12.5 x 7.5 in.). Part Number 3166216. Test tube clips are stainless steel and hold 13mm to 25mm tubes. (20) will fit in models TSSWB15, TSSWB15S, and TSDUB15. (48) will fit in model TSSWB27. Each clip requires one fastener (item 3166189). Part Number 3166227. Flask clips allow you to secure flasks to the bath platform. The clips are stainless steel. (20) will fit in models TSSWB15, TSSWB15S, and TSDUB15. (48) will fit in model TSSWB27. Each clip requires one fastener (see item 3166189, Package of 25 Clip Fasteners). Part Number 3166198. Flask clips allow you to secure flasks to the bath platform. The clips are stainless steel. (15) will fit in models TSSWB15, TSSWB15S, and TSDUB15. (36) will fit in model TSSWB27. Each clip requires one fastener (see item 3166189, Package of 25 Clip Fasteners). Part Number 3166221. Flask clips allow you to secure flasks to the bath platform. The clips are stainless steel. (9) will fit in models TSSWB15, TSSWB15S, and TSDUB15. (24) will fit in model TSSWB27. Each clip requires one fastener (see item 3166189, Package of 25 Clip Fasteners). Part Number 3166566. Flask clips allow you to secure flasks to the bath platform. The clips are stainless steel. (6) will fit in models TSSWB15, TSSWB15S, and TSDUB15. (14) will fit in model TSSWB27. Each clip requires one fastener (see item 3166189, Package of 25 Clip Fasteners). Part Number 3166199. Flask clips allow you to secure flasks to the bath platform. The clips are stainless steel. (4) will fit in models TSSWB15, TSSWB15S, and TSDUB15. (12) will fit in model TSSWB27. Each clip requires one fastener (see item 3166189, Package of 25 Clip Fasteners). Part Number 3166200. Flask clips allow you to secure flasks to the bath platform. The clips are stainless steel. (2) will fit in models TSSWB15, TSSWB15S, and TSDUB15. (5) will fit in model TSSWB27. Each clip requires one fastener (see item 3166189, Package of 25 Clip Fasteners). Part Number 3166189. Clip Fasteners are used to hold flask clips to the bath platform. One fastener is required for each flask clip. Part Number 3162640. The gassing hood permits control over the atmosphere surrounding the sample. It also improves temperature uniformity and reduces energy consumption. Hood is polished stainless steel with a plastic gas fitting. Each bath will accommodate 1 large hood. Measures 11.21 x 11.35 inches. Part Number 3162639. The gassing hood permits control over the atmosphere surrounding the sample. It also improves temperature uniformity and reduces energy consumption. Hood is polished stainless steel with a plastic gas fitting. Each bath will accommodate 2 small hoods. Measures 5.6 x 11.35 inches.